My favorite thing about Fluorite is the way it mimics other stones. 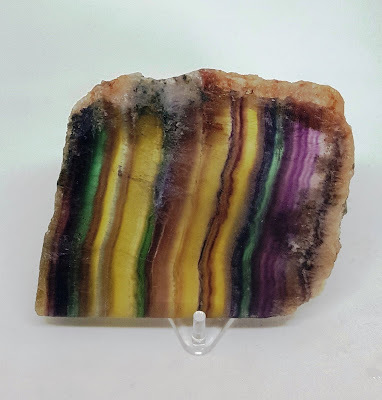 For example, if I had cut a long, thin strip of the slab above and then cabbed it, it could appear to be Tourmaline. 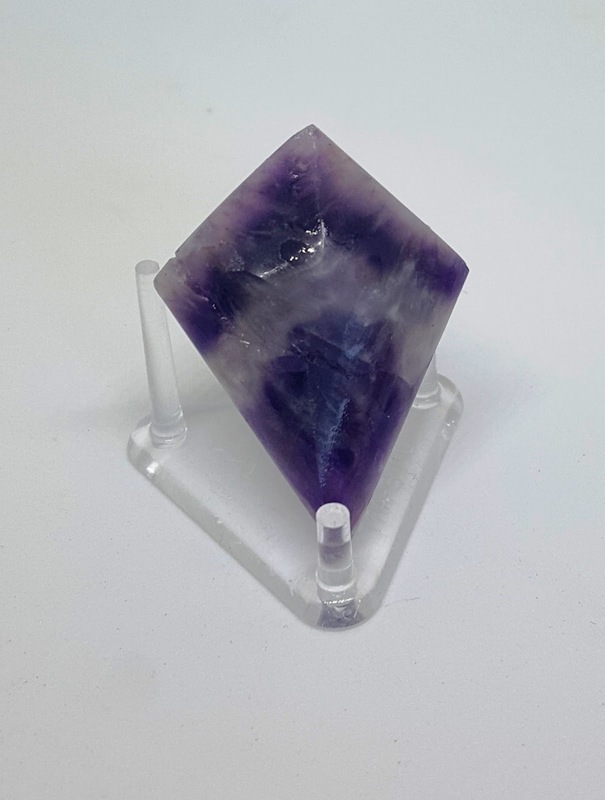 It can even look at bit like Amethyst if you get the pictures just right. There's a HUGE difference between Fluorite and Amethyst or Tourmaline as any lapidarian can easily tell. Fluorite is only a 4 on the Mohs harness scale. Amethyst is a much harder 7 and Tourmaline is a 7-7.5. So working it for lapidary purposes has two problems. First, it doesn't take much of a polish (full disclosure: the Fluorite pictures for this blog post were taken when the rocks were wet). Second, because it is so soft, unless you coat it with a shellac or something similar, it will scratch easily. NOT NAMED FOR ITS LOOKS! This mineral was officially named by Carlo Antonio Galeani in 1797. His inspiration was the fact that it was used as a flux in iron smelting to reduce the viscosity of slags. He gave it the name from Latin "fluere", to flow. 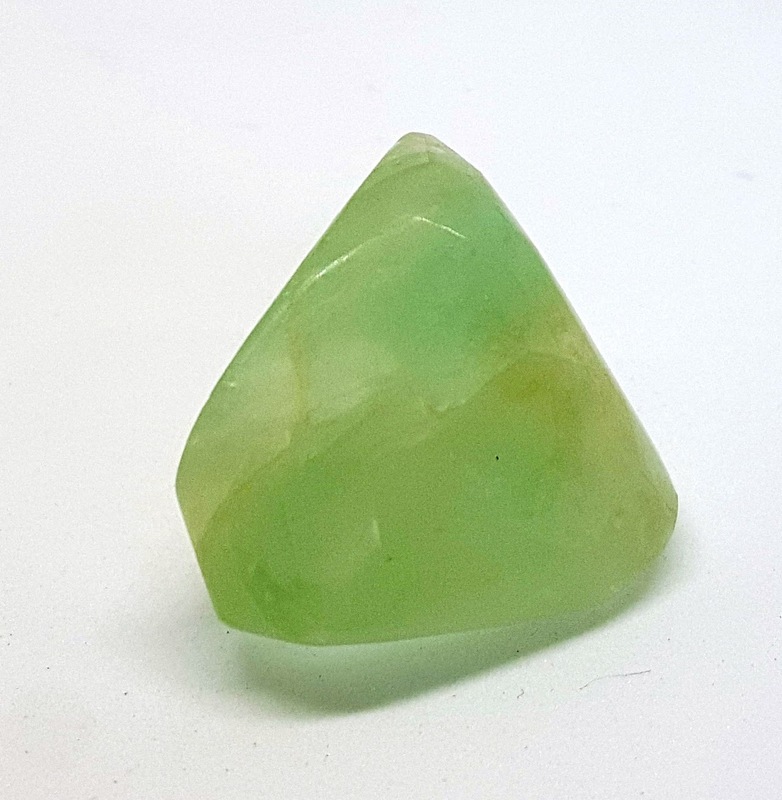 Over time, fluorite has also been used as a flux in the manufacture of some glasses and enamels. According to Nightsea.com Sir George Stokes (1819-1903), a mathematics professor at the University of Cambridge, gave the effect its name. In the early 1850’s Stokes noted the color shifting effects in the mineral fluorspar and investigated in greater detail. A key experiment was using a prism to isolate ultraviolet light and observe blue emission. He was first inclined to call this ‘dispersive reflection’, implying a reflection to a different wavelength. He wrote:“I confess that I do not like this term. I am almost inclined to coin a word, and call the appearance fluorescence, from fluor-spar, as the analogous term opalescence is derived from the name of a mineral.” I agree with Stokes, dispersive reflection doesn't sound half as nice as fluorescence. I'm finding his whole fluorescent thing pretty interesting and I'm planning to do a blog post on it soon! GIVE ME THAT FLUORITE GRIN! Yes, the fact that the mineral "Fluorite" and the toothpaste additive "Fluoride" sound alike is no accident; but don't try rubbing your mineral samples on your teeth. The Food & Drug Administration has approved three compounds, stannous fluoride, sodium fluoride and sodium monofluorophosphate as toothpaste additives to prevent cavities. The compounds are manufactured by reacting sulfuric acid with fluorspar, a calcium fluoride ore. It apparently doesn't take much. The box for my Crest Complete lists sodium flouride (NaF) as the only active ingredient and it is only 0.243% of the product. 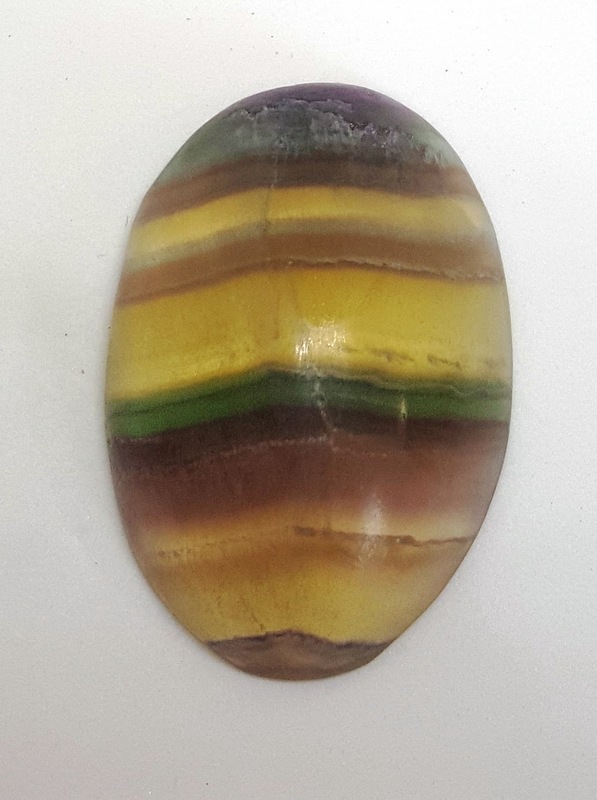 I LOVE the first stone, the first image with the stripes in it. I think that striped effect is my favorite image here. 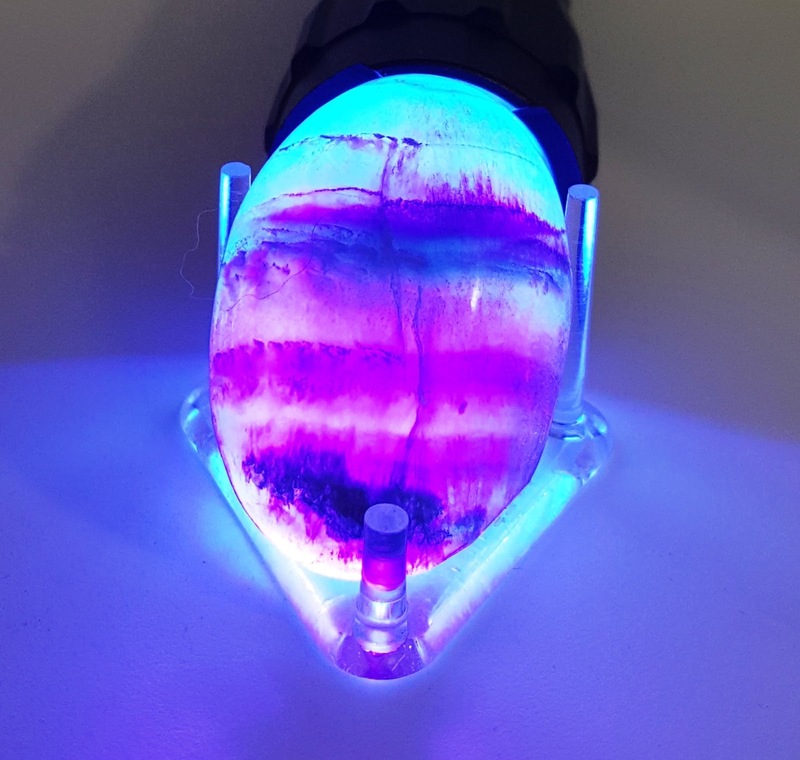 I also love, however, the piece that is polished and then backlit with UV light. AMAZING!! !